The study of galaxy formation and evolution is concerned with the processes that formed a heterogeneous universe from a homogeneous beginning, the formation of the first galaxies, the way galaxies change over time, and the processes that have generated the variety of structures observed in nearby galaxies. It is one of the most active research areas in astrophysics. Galaxy formation is hypothesized to occur, from structure formation theories, as a result of tiny quantum fluctuations in the aftermath of the Big Bang. The simplest model for this that is in general agreement with observed phenomena is the Λ-Cold Dark Matter cosmology; that is to say that clustering and merging is how galaxies gain in mass, and can also determine their shape and structure. This artist’s impression shows two galaxies in the early universe. The brilliant explosion on the left is agamma-ray burst. As the light from the burst passes through the two galaxies on the way to Earth (outside the frame to the right), some colours are absorbed by the cool gas in the galaxies, leaving characteristic dark lines in the spectrum. Careful study of these spectra has allowed astronomers to discover that these two galaxies are remarkably rich in heavier chemical elements. The majority of mass in galaxies is made up of dark matter, a substance which is not directly observable, and might not interact through any means except gravity. Halo stars are typically much older and have much lower metallicities (that is to say, they are almost exclusively composed of hydrogen and helium) than disk stars. Many disk galaxies have a puffed up outer disk (often called the “thick disk”) that is composed of old stars. Globular clusters are typically old and metal-poor as well, but there are a few that are not nearly as metal-poor as most, or have some younger stars. High-velocity clouds, clouds of neutral hydrogen are “raining” down on the galaxy, and presumably have been from the beginning (this would be the necessary source of a gas disk from which the disk stars formed). 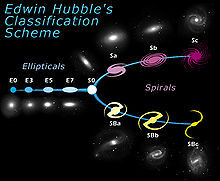 Galaxies come in a great variety of shapes and sizes (see the Hubble sequence), from giant, featureless blobs of old stars (called elliptical galaxies) to thin disks with gas and stars arranged in highly ordered spirals. The majority of giant galaxies contain a supermassive black hole in their centers, ranging in mass from millions to billions of times the mass of our Sun. The black hole mass is tied to properties of its host galaxy. Many of the properties of galaxies (including the galaxy color–magnitude diagram) indicate that there are fundamentally two types of galaxies. These groups divide into blue star-forming galaxies that are more like spiral types, and red non-star forming galaxies that are more like elliptical galaxies. The key properties of disk galaxies, which are also commonly called spiral galaxies, are that they are very thin, rotate rapidly, and often show spiral structure. One of the main challenges to galaxy formation is the great number of thin disk galaxies in the local universe. The problem is that disks are very fragile, and mergers with other galaxies can quickly destroy thin disks. Olin Eggen, Donald Lynden-Bell, and Allan Sandage in 1962, proposed a theory that disk galaxies form through a monolithic collapse of a large gas cloud. As the cloud collapses the gas settles into a rapidly rotating disk. Known as a top-down formation scenario, this theory is quite simple yet no longer widely accepted because observations of the early universe strongly suggest that objects grow from bottom-up (i.e. smaller objects merging to form larger ones). It was first proposed by Leonard Searle and Robert Zinn that galaxies form by the coalescence of smaller progenitors. More recent theories include the clustering of dark matter halos in the bottom-up process. Essentially early on in the universe galaxies were composed mostly of gas and dark matter, and thus, there were fewer stars. As a galaxy gained mass (by accreting smaller galaxies) the dark matter stays mostly on the outer parts of the galaxy. This is because the dark matter can only interact gravitationally, and thus will not dissipate. The gas, however, can quickly contract, and as it does so it rotates faster, until the final result is a very thin, very rapidly rotating disk. Astronomers do not currently know what process stops the contraction. In fact, theories of disk galaxy formation are not successful at producing the rotation speed and size of disk galaxies. It has been suggested that the radiation from bright newly formed stars, or from an active galactic nuclei can slow the contraction of a forming disk. It has also been suggested that the dark matter halo can pull the galaxy, thus stopping disk contraction. In recent years, a great deal of focus has been put on understanding merger events in the evolution of galaxies. Our own galaxy (the Milky Way) has a tiny satellite galaxy (the Sagittarius Dwarf Elliptical Galaxy) which is currently gradually being ripped up and “eaten” by theMilky Way. It is thought these kinds of events may be quite common in the evolution of large galaxies. The Sagittarius dwarf galaxy is orbiting our galaxy at almost a right angle to the disk. It is currently passing through the disk; stars are being stripped off of it with each pass and joining the halo of our galaxy. There are other examples of these minor accretion events, and it is likely a continual process for many galaxies. Such mergers provide “new” gas, stars, and dark matter to galaxies. Evidence for this process is often observable as warps or streams coming out of galaxies. The Lambda-CDM model of galaxy formation underestimates the number of thin disk galaxies in the universe. The reason is that these galaxy formation models predict a large number of mergers. If disk galaxies merge with another galaxy of comparable mass (at least 15 percent of its mass) the merger will likely destroy, or at a minimum greatly disrupt the disk, yet the resulting galaxy is not expected to be a disk galaxy. While this remains an unsolved problem for astronomers, it does not necessarily mean that the Lambda-CDM model is completely wrong, but rather that it requires further refinement to accurately reproduce the population of galaxies in the universe. A spiral galaxy, ESO 510-G13, was warped as a result of colliding with another galaxy. After the other galaxy is completely absorbed, the distortion will disappear. The process typically takes millions if not billions of years. The most massive galaxies in the sky are giant elliptical galaxies. Their stars are on orbits that are randomly oriented within the galaxy (i.e. they are not rotating like disk galaxies). They are composed of old stars and have little to no dust. All elliptical galaxies probed so far have supermassive black holes in their center, and the mass of these black holes is correlated with the mass of the elliptical galaxy. They are also correlated to a property called sigma which is the speed of the stars at the far edge of the elliptical galaxies. Elliptical galaxies do not have disks around them, although some bulges of disk galaxies look similar to elliptical galaxies. One is more likely to find elliptical galaxies in more crowded regions of the universe (such as galaxy clusters). Astronomers now see elliptical galaxies as some of the most evolved systems in the universe. It is widely accepted that the main driving force for the evolution of elliptical galaxies is mergers of smaller galaxies. These mergers can be extremely violent; galaxies often collide at speeds of 500 kilometers per second. Many galaxies in the universe are gravitationally bound to other galaxies, that is to say they will never escape the pull of the other galaxy. If the galaxies are of similar size, the resultant galaxy will appear similar to neither of the two galaxies merging, but would instead be an elliptical galaxy. In the Local Group, the Milky Way and M31 (the Andromeda Galaxy) are gravitationally bound, and currently approaching each other at high speed. If the two galaxies do meet they will pass through each other, with gravity distorting both galaxies severely and ejecting some gas, dust and stars into intergalactic space. They will travel apart, slow down, and then again be drawn towards each other, and again collide. Eventually both galaxies will have merged completely, streams of gas and dust will be flying through the space near the newly formed giant elliptical galaxy. M31 is actually already distorted: the edges are warped. This is probably because of interactions with its own galactic companions, as well as possible mergers with dwarf spheroidal galaxies in the recent past – the remnants of which are still visible in the disk populations. In our epoch, large concentrations of galaxies (clusters and superclusters) are still assembling. While scientists have learned a great deal about ours and other galaxies, the most fundamental questions about formation and evolution remain only tentatively answered.